Conventional Suction Pumps are limited in their application by the efficiency of their priming systems and in practice such pumps are restricted to an effective suction lift of 8 to 9 metres, to such an extent that at 9 metres lift some 90% of the output flow is lost. For lifts greater than this an alternative has to be found. 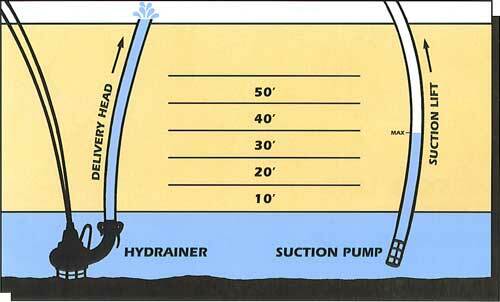 Submersible Pumps eliminate the problem of suction lift completely, and only have to cope with the discharge head and friction loss in the discharge hose. 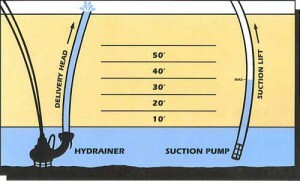 Having eliminated the limitations of the suction lift good output is maintained to great depths. Hydrainer have combined the benefits of the submersible pump and the mobility of the diesel drive to create a hydraulically driven submersible pump. 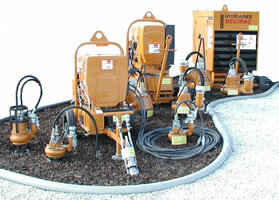 It is now recognised that Hydrainer have the most reliable and cost effective system for portable pumping applications. Most moving parts operate in clean oil, and as a consequence there is far less risk of mechanical failure – the major factor in ensuring high performance, trouble free operation. The Power Packs are available with a variety of prime movers incorporating a wide range of engines.Chassis types include site trailer, highway trailer and skid units. These together with the HYDRAINER range of Submersible Pumps combine to offer a highly flexible, efficient and cost effective pumping system.